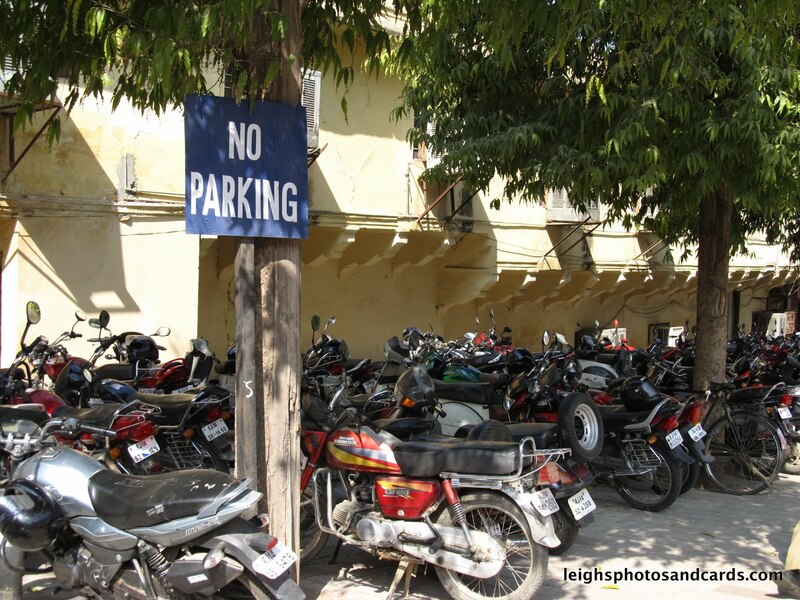 Traffic in an Indian city has its own ethic. I say ethic because it’s definitely not laws or lights that govern it and more of a social understanding and natural pecking order. In the city lights are suggestions. You go when you push out far enough to make the oncoming traffic stop. The horn is used to tell people you are approaching from behind and cities are unbelievably loud. While traffic should be on the left side of the road – reversed to what I’m used to – instead it seems you can drive on whatever side of the road suits you as long as something bigger is not coming. I look both ways on a one-way street. And people here really have brilliant vehicle handling skills – they duck and dodge and weave through traffic, pass in the dirt on the shoulder or cut someone off with 6 inches. It’s basically the same in the country except there are less vehicles and the roads are narrower, so if something bigger than you is coming and there is not enough room, you get off the road. If traffic comes behind you the honk and then come on through. So, yes, riding here is intimidating. But there is a method to the madness. And we quickly learned that as long as you ride consistently and in a line they will get around you. And, it’s essential to understand your spot in the traffic food chain. In the traffic food chain, it’s ultimately the size of your vehicle and a motor that determines the pecking order on the roads. As best I can tell the pecking order looks something like this, from the top of the food chain to the bottom. Big lorries with brightly painted fronts and sides- often strung with decorative garlands and blaring loud music. Tractors pulling painted wagons filled with everything from people to huge loads of stone. Motorcycles – often with up to four people on them. Many times you see the man driving and the woman/child sitting sideways on the back. Carts drawn by horses, oxen or- yes – quite a few camels. The camels are often decorated with their hair shaved in designs and painted and have bright garlands off their harnesses. Normal people on Bicycles- ridden by many folks to get around. Big utilitarian bikes. Funny looking tourists on bikes. And then us – in our helmets and bright clothes looking like the circus. Pedestrians who walk on a rare sidewalk, but more often in the gutter or street. Dogs – most are very lethargic and just sleep in piles of garbage by the road or scavenge. We see quite a few dead dogs who didn’t move in time, though traffic goes to extraordinary lengths- even dangerous swerves to avoid killing animals. Great observation and description, Leigh. This sounds quite similar to traveling through latin america — but I was on a motorcycle which is pretty high up the chain as you note. And yes, did manage to get 3 or more on it at times. Travel in the cities was pretty much as you described. No rules, heavy use of horns etc., and no street signs anywhere either so navigation was an interesting proposition. Would be interested to hear how you guys do the route, others in your party etc. Interesting stuff! Thanks for sharing.